Sherrie Flick is the author of the novel Reconsidering Happiness, the flash fiction chapbook I Call This Flirting, and the short story collection Whiskey, Etc., winner of the Foreword INDIES bronze prize and named one of Entropy’s Best Fiction Books of 2016. 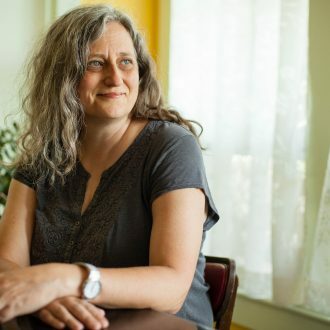 Her fiction has appeared in many journals and anthologies, including Ploughshares, SmokeLong Quarterly, and W.W. Norton’s Flash Fiction Forward, New Sudden Fiction, and New Micro. She has received grants and fellowships from Pennsylvania Council on the Arts, The Heinz Endowments, Sewanee Writers’ Conference, Ucross, Atlantic Center for the Arts, and Virginia Center for the Creative Arts. She works as a freelance writer and teaches in the Food Studies and MFA programs at Chatham University. In Fact Books will publish a book of her narrative nonfiction in 2018.